Spanish veteran Daniel Rasilla (30-8-2) has replaced compatriot Jorge Fortea, who is out due to a hand injury as opponent for Florin Cardos (13-0) for the show in Cluj-Napoca (Romania) Februari 21. At stake is the vacant WBC version of the Mediterranean welterweight title. French Etoile Verte Production, headed by Abdelilah Rahilou and Driss Chibli, won purse bids in Rome for the fight between Hadillah Mohummadi (18-3-1) and Mariano Hilario (11-2) for the vacant EBU supermiddleweight title. EVB bid 51 000 Euro while Rimer Boxe came in with a bid for 8 000 Euro. The fight will go ahead at the Velodrome in Saint-Quentin-en-Yvelines (France) at a date to be announced. Mohummadi vs Hilario was - as we previously reported - first set for Dec 20 but was postponed three times and then the EBU called for purse bids and the very same promoter, EVP, that postponed three times has now won the right to try a fourth time. 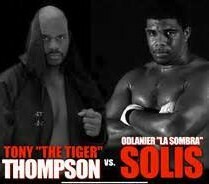 The rematch between heavyweights Odlanier Solis and Tony Thompson that after many postponements was set for February 27 in Budapest (Hungary) is off again. The Solis vs Thompson II show was a co-promotion between Felix-Promotion and Arena Box Promotion (headed by Ahmer Oener) but the head of Felix-Promotion, Felix Racz, states that Arena’s Hungarian representatives had paid only 20% of the expenses at the final deadline which was Thursday (Feb 5). According to Racz everything was all set including a camera team to televise the show first on Sport TV and later on EuroSport. Racz wants to make it clear he don’t feel Ahmet Oener is to blame but rather Arena’s local representatives who failed to live up to their promises. For Odlanier Solis, who lost the first time around to Thompson in March of last year after another slowpaced, lazy performance, a win in the rematch is crucial to get his career back on track. The rematch was first set for early this fall but has since been postponed a few times for various reasons. Meanwhile, Oener says Solis - Thompson II will go ahead in Turkey February 27. French superwelter Cedric Vitu (41-2) outscored Davit Ribakoni (6-6-5) Friday (Feb 13) evening in Louvroil. Next up for Vitu, who is mandatory challenger, could be a fight against EBU champ Jack Culcay (19-1). There will be purse bids in Rome February 23. Vitu’s sole losses came against Sergey Rabchenko and Hamlet Petrosyan and both fights were very close.